It really shouldn’t work. Just when you think that the EX1 has the worst ergonomics of a supposedly professional camera, Canon unleashed the EOS 5D Mk2 (catchy name) onto the market with its mind-boggling video capabilities and even crazier ergonomics. Or lack thereof. The surge in uptake by video professionals has probably taken even Canon by surprise, so we’re not going to criticise the camera’s design for video use. And yet it’s everywhere, changing the game. I came across the work of Dan Chung on the Guardian’s site recently. He’s filming and editing news reports on the EOS, sometimes in difficult situations. Candid yet cinematic, redefining what news footage can look like. On the other hand there’s a new breed of corporate movie about, where the image looks way better than the script. Everyone’s talking about this camera. No, not just us camera geeks, I mean clients are talking about it. And when clients get excited about technology, something is up. It’s a bit like the Red camera, where there’s a certain amount of chest puffing in that this spot or that video “was shot on Red”. Suddenly, it’s all the rage. Well, in the current economic climate, it’s all about doing more with less and the EOS 5D Mk2, hereinafter referred to as the 5D2, would seem to float that particular boat. What’s not to love? Wafer thin DoF, incredible low light performance, some amazing lenses, a discrete form factor, a bargain entry price based on current mid-size camcorders, and with all the buzzwords checked (HD, film look, progressive…). But it’s not all sweetness and roses. The limitations are awesome. You’re stuck at 30fps, so there’s a whole load of pain to get to 24 or 25. The way you get from the true camera resolution to the mere HD resolution is rather truculent – just chuck out 3 lines out of every 4 – and that leads to aliasing on diagonal lines and twittering in areas of detail. Then there’s the footage, which needs to be slowly and painfully transcoded into something else if you want to actually edit it. Then you’ll have to switch the camera’s firmware to Magic Lantern in order to get some semblance of full manual control and obtain nicities such as audio level meters. Oh yes, and audio. You’ll either go back to the days of recording separate sound and synchronising the rushes, or you’ll need extra hardware bolted onto the camera. And that leads me to the next biggie in this DSLR dance: hardware. The general consensus amongst users is that once you’ve got your 5D2, you’ll need some sort of audio hardware like a BeachTek or JuicedLink so you can plug in decent microphones, a decent shoulder brace, an eyepiece to enable you to view the rear screen as if it were a viewfinder, and you’ll want a few lenses at the higher end of the scale (wider aperture). Then you’ll need a truck load of high end CF cards, and not huge capacity ones as ML doesn’t like them. So, in fact, when you tot it all up, to get as close as you can to camcorder functionality with usable audio, even with a few modest lenses, it’s going to be more than a Sony EX1. And even then it’s going to be a bit of a pig to edit – transcoding to an editing format like ProRes takes time (and it can take a LOT of time), but even then the images don’t take grading well. And are you going for 25fps to mix with other footage? And you want sound with that? Above all this sits the footage. When done well, it’s sublime. Every time I see a good 5D2 sequence, I think I can forgive it its many, many shortcomings. But every time I do a job and pause to think ‘if this was an EOS job’, I get cold feet. Of course there’s always the option of going for a DoF adaptor. Again, in the right hands, amazing things happen, but it requires careful setup and steals a little light in the process. And then there’s the Scarlet which may cause all bets to be off (and a recent glimpse of the prototype makes it look like a Cyberdyne Systems T101 take on the 5D2). The 5D2 would seem to be a comfortable choice as a ‘special effects’ camera rather than as the centre of a whole system (though there are many people doing just that). 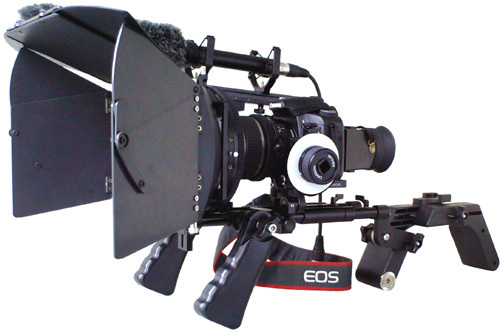 A separate camera for doing ultrawides, long teles, the macro closeups, the timelapses, the extreme DoFs and so on. So long as you can play to its strengths and know how to work around its weaknesses, it’s an amazing tool. If you own the popular Sennheiser Evolution 100 G2 wireless mic system, you’ll be aware of the horrible, pig-ugly, cheap and tacky clothes pegs that are attached to their microphones. Owners have been crying out for a replacement, literally begging suppliers for something – anything – that will clip the little, non-standard microphones onto stuff. Well, we can all buy a beer for Marcus Durham, who tipped me the wink about using the Shure WL93 Tie clip, for about a tenner for two (one left hand, one right hand). They’re plastic, and not exactly invisible, but ye gods, what a difference! I’ve looked through a few of my videos recently (see the post about show reels), and I’m wincing every time the ghastly appendages crop up like big plastic dung beetles. My son demonstrates the difference. These replacement clips are an absolutely mandatory purchase for every G2 owner. I really need to do a show reel. I’m not really sure why – I’ve not been asked for one – yet. But it’s one of those things that we all need. Anyone in the Creative world has a portfolio. A sketchbook. A sampler. A show reel. And cranking one out is difficult. A show reel can become one of those things that one obsesses over. It’s not for you. Yes, it’s about you and what you do, but it’s for your clientele. What do they want to see? When I was hiring Graphic Designers, I liked to see the iterations to the final design. The rough sketches and the wild ideas. But some people don’t want to know how the cow was killed, just what the steak tastes like. Seeing how shots are put together, as layer upon layer of finesse are applied to the same shot, are great for post houses and Motion Graphics folks, but if you’re selling camerawork, you need exquisite photography, images that grab your vision and pull you into the screen by the eyeballs. Soundscapes, music tracks, riffs and reveals. wrap little chunks of programmes into a ‘compilation’ which will demonstrate some degree of editing as well as camerawork and general style, but makes for a longer reel. You’re looking at six 30 second chunks for a 3 minute reel and that will feel LONG. And you’re somewhat at the mercy of the clients’ requirements if you shoot Corporates. Your audience will actually have to identify with the subject matter. pick some of your favourite (how do we define ‘best’?) shots and sequences, some ‘before’ and ‘after’ (e.g. chromakey or grading) and some motion graphic stuff and beat until stiff with a high energy sound track. But it’s really a peacock tail. Looks great, probably sounds great, not that you’d want a finished video that actually looks like that. There’s another danger lurking in the shadows: you’re thumbs up or thumbs down within 30 seconds of your video starting, and yet – cruelly – the first 5-10 seconds will be dead air whilst your audience finally gets your video playing, finds a comfortable position, reaches for the pen and the paper and the beverage that suddenly seems to have disappeared, and the ‘You Have Mail’ symbol on their phone and utterly fails to notice your expensive Motion Graphics intro. So we sit there making lists of stuff we’ve shot or edited, auditioning sound tracks, maybe even trawling through rushes and old edits to find those gems that got lost on the cutting room floor, and sneaking a peek at on-line show reels, and suddenly you realise that there’s a huge enemy that’s sitting right beside you. Yes, folks: the enemy of ‘Good’ is ‘Better’ and it will absolutely mash your aspirations of a good reel into the ground. … And suddenly the phone rings a year later and somebody asks you for a show reel. You’ve been working on it, on and off, for ages. It’s just a project on a hard disk, not earning you money or getting you exposure, just acting like a millstone round your neck. Show reels need to be out there, doing things. Waiting to get things perfect may miss you the opportunity to at least tempt somebody asking to see more. You’ve got to be in it to win something, so get good stuff together, and get it out and working for you. I’ll come clean: I’ve tried one route which, whilst not being catastrophic or damaging in any way, has been spectacularly pathetic in doing what I hoped it to do. Instead of making a show reel, I grouped together some of my work that I liked and put it on the web. “Here’s the kind of stuff I do” in its pure, unadulterated form. Half a dozen (it rapidly swelled to a dozen) little video things for clients to browse from. TOO MUCH – imagine feeling thirsty after a stroll and seeing a cafe. You go in, but rather than a cup of tea and a bun, there’s a full waiter service, a big menu in a slightly pretentious language, and when you say ‘just a cup of tea’ you get asked ‘Earl Grey, Lapsang, English Breakfast, Green – or how about our herbal teas, including….’ At which point you’re out the door. TOO DEMANDING – hey, it’s my store front. I want the best that technology can get. H.264, high bit rate, large video areas, full-on Flash front end. Guess what? My audience doesn’t have the processing power to make H.264 smooth, they don’t have the IT policy that allows them to update Flash, and aren’t allowed to watch streaming video – and hey, they ain’t going to watch it at home. TOO BROAD – Let’s face it: we are all multifunctional beasties here. You may be able to trick light into making a bottle of ketchup look like the elixir of life, or take a bag full of tapes and pull a heart-wrenching story from its soup. You’ve got an encyclopaedic knowledge of Brassicas, and can write clean C++, but your clients don’t know that – nor do they know about your Cajun cooking skills and deftness with a steam iron and ninja nappy chops. So that’s not going into your visual CV, okay? You don’t go to a cafe for steak, let alone a car wash.
People who watch show reels want to see something that solves (or at least salves) their current need. Maybe you need two reels. Or seven. Does somebody making studio shows or costume drama want to watch a reel about food? No. But if your reel has food and talking heads and weddings and dogs, then you’re going to find clients who will chuck you into anything. And that may be your bag. So, where does all this lead us? Make a reel from your best stuff, but don’t try to hone it to perfection at the expense of not finishing it. To paraphrase Guy Kawazaki: ship, then test. Ask people about your reel. Change things (but not necessarily the things somebody doesn’t like) and test again. Rinse. Repeat. Make different versions for different markets. Refresh it often. Your reel is NEVER finished, but it’s out there. Make the audience want more.